David bought this deal: [55% off] THREE mouth-watering meals and ONE jug of ice cold Tiger beer for RM66 instead of RM146, at Finnegan's. So, we chose to dine at the Finnegan's Irish Pub & Restaurants outlet at Mid Valley, right after we came back from our weekend trip to Sg. Klah Hot Springs, Sungkai. 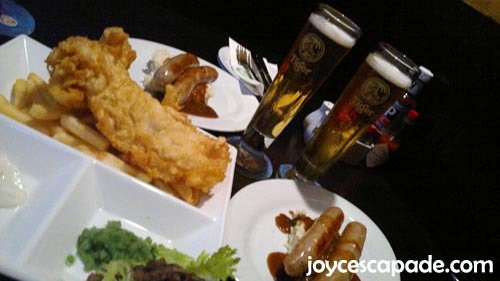 We had THREE hearty and scrumptious meals consisting of two servings of Finn's Bangers & Mash and one serving of Finn's Fish & Chips. 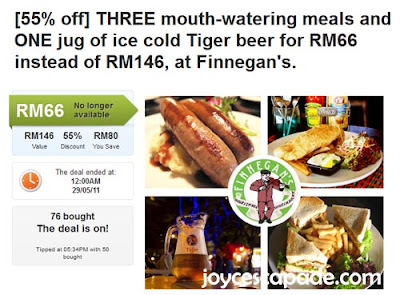 On top of that, we had one jug of Tiger Beer. Finnegan's serves standard pub food - not exactly super delicious but their portions are huge enough to fill your growling stomach.